MyViewpad is a new image viewer that can be used both as a stand alone application and as a Total Commander plugin. 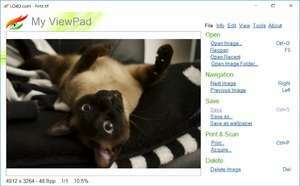 -Why MyViewPad? -Because it is the best free viewer of digital graphics. Over several years of working on a graphics engine our company created a truly stable, quality product. For security reasons, you should also check out the MyViewPad download at LO4D.com which includes virus and malware tests. Additional screenshots of this application download may be available, too.